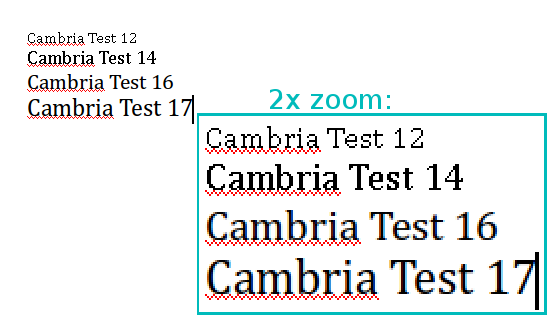 A lot of documents are starting to use the new vista fonts like cambria, calibri, and others. The problem is that those fonts are displayed ugly, without aliasing, for sizes less than 16px. See atached screenshot. Other fonts don't show this problem. I'm using hardy, with LCD subpixel aliasing. The use of unaliased fonts for low pixel sizes is a fontconfig policy setting; reassigning to that package. fontconfig's 70-no-bitmaps.conf only rejects bitmap (non-scalable) fonts, but does not disable embedded bitmap in fonts. Perhaps it can be updated to also remove embedded bitmaps?